A year after learning of Powertech Uranium Corp.'s proposal to mine uranium, the Town of Wellington's Board of Trustees will consider adopting two resolutions on the matter at the board's April 8 meeting. The meeting begins at 7:30 PM at the Leeper Center, 3800 Wilson Avenue. The Leeper Center is in the same building as the Wellington Library. If the project is approved by federal, state, and county agencies, in situ and possibly open pit uranium mining would take place six miles east of the Wellington town limits and only 4.5 miles east of the town's proposed Growth Management Area. The mining area is in neighboring Weld County, and the town's only option for influencing the outcome of the permit process is to adopt a nonbinding resolution on the matter. The City of Fort Collins and the Town of Timnath have already passed strongly-worded resolutions urging regulatory agencies to deny any and all permits for the project. The governing bodies of Fort Collins and Timnath seem to understand the potential damage that nearby uranium mining could do the economic vitality of the region. And they acknowledge the inherent environmental and public health risks associated with such mining. Recent reports of an investigation by the Wyoming Department of Environmental Quality into the state's only operational uranium mining facility have bolstered the concerns of northern Colorado public officials and residents. In March, Wyoming regulators issued a Notice of Violation to Power Resources Inc., which operates the Smith-Highland Ranch in-situ leach uranium mine north of Douglas. Wyoming officials describe an alarming volume of environmental violations including spills, leaks, excursions, and delayed aquifer restoration. According to state documents, the violations are routine and have been going on for years. Power Resources Inc. is a wholly-owned subsidiary of Canadian company Cameco Corporation. At its March 25 meeting, the Wellington Board of Trustees discussed the uranium mining proposal and whether the board should consider a resolution opposing the project. Four board members, Travis Stevens, Travis Vieira, Mishie Daknis, and David Noe expressed concern about the project. Mike Steely and Karen Ziegler didn't seem to have an opinion. 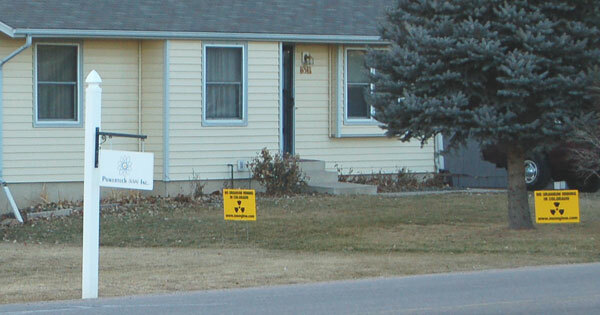 Mayor Larry Noel simply commented on his strong support for property rights, implying that Powertech's ownership of uranium mining rights trumps the property rights of landowners in and near the mining area. Since that meeting, voters elected Jack Brinkhoff to replace outgoing trustee Karen Ziegler. Several area residents addressed the board urging them to take a stand against the mining project in the interest of the town's long-term economic and environmental health. Nearly all the speakers live near the mining area. In my opinion, the trustees have a rare opportunity on Tuesday evening to take a stand for the town, its residents and businesses, and all those who live in the surrounding area who consider themselves members of the Wellington community. Please contact the trustees and ask them to pass a resolution against Powertech's uranium mining project. Unfortunately, the town has provided no mechanism for directly contacting the trustees, so email messages must be sent to Cynthia Sullivan, the Deputy Town Clerk at sullivcj@co.larimer.co.us. Ms. Sullivan's phone number is (970) 568-3381. Her fax number is (970) 568-9354. Letter from John Corra, DEQ Director and Donald McKenzie, Administrator-Land Quality Division to John McCarthy, Manager-Health, Safety and Environmental Affairs-Power Resources, Inc.
SUMMARY: WYOMING DEPARTMENT OF ENVIRONMENTAL QUALITY NOTICE OF VIOLATION TO POWER RESOURCES, INC.